Lakers have lost five of six at Staples Center, winning just once at home since Nov. 24. The postgame whoops and hollers from the visitors’ locker room were audible through two closed doors after the Philadelphia 76ers capitalized on their final chance in 2013 to end their 13-game road losing streak. Thaddeus Young scored seven of his 25 points in the fourth quarter, Evan Turner added 22 points, and the 76ers hung on for their first road win since Nov. 1, beating the depleted Los Angeles Lakers 111-104 on Sunday night. Spencer Hawes had 19 points and eight rebounds, while Young and Michael Carter-Williams contributed big points down the stretch as the last-place Sixers held on for just their second win in 11 games overall. "You keep hammering the rock, and one day it’s going to split," Philadelphia coach Brett Brown said. "Tonight it split." The Lakers are a shadow of their traditional selves these days, with Pau Gasol joining Kobe Bryant and Steve Nash on the sidelines for this meeting. That didn’t dampen the Sixers’ enthusiasm after doubling their road win total in the second game of a back-to-back set. Philadelphia had lost 19 of 23 since its unlikely 4-2 start to the season. Jordan Hill was impressive tonight. Bad loss, but he played well. 18 points, 13 rebs, steal and a block. SOLID effort. "Wins from time to time help validate the work that everybody is putting in," Brown said. "If there’s such a thing as deserving something, I think they deserved it." Philadelphia went up 104-99 with 1:44 to play on a layup by Young, who added a three-point play on the next possession. Jordan Farmar’s 3-pointer with 55 seconds left cut the Sixers’ lead to three points, but Shawne Williams missed an open 3-pointer that could have tied it, and Carter-Williams hit two late free throws to secure Philadelphia’s second straight road win over the Lakers. "It’s definitely a great way to close out the year," Young said. "We’ve been playing hard all season long. Our record doesn’t say we’re going out there and doing the job, but we’re working to get better every time." 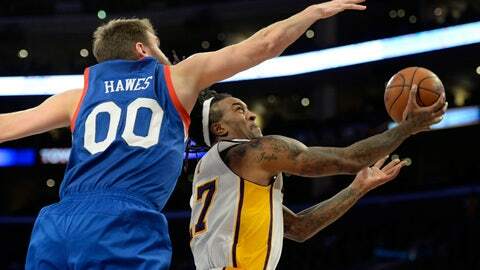 Nick Young scored 26 points on 6-for-21 shooting in the Lakers’ fifth consecutive loss. Los Angeles also has lost five of six at Staples Center, winning just once at home since Nov. 24. Gasol missed his second straight game with a respiratory infection for the Lakers, who already were without Bryant, Nash and Steve Blake. Chris Kaman suited up despite limited movement on his injured ankle, and Jordan Hill contributed 18 points and 13 rebounds while starting at center. Los Angeles then lost swingman Xavier Henry to a strained right knee in the first quarter. Henry recently filled in at point guard while Bryant and the Lakers’ top three point guards were injured. Henry still sounded upbeat: "Worst things have happened. All I can do is go to my MRI tomorrow, see what they say & go on from there." "We had guys battling, but we just don’t have enough right now," Lakers coach Mike D’Antoni said. "It’s tough to gauge where we are because we don’t quite know what we’re going to get when we get out there. … We’ve got to turn the corner somehow. We’ve got to get a couple of breaks and get some momentum going." Two days after the Lakers lost to Utah, the Western Conference’s last-place team, Los Angeles lost to another one of the NBA’s worst. Injuries are an undeniable factor, but the Lakers’ 22 turnovers and 37-percent shooting might have been topics of general manager Mitch Kupchak’s meeting with D’Antoni after the game. Jodie Meeks scored 15 points as the Lakers used their 16th starting lineup in 31 games, including seven straight games with a new starting five since Bryant broke a bone near his knee. "We’ve just got to go out there and find ourselves again," Nick Young said. "We have to bring our energy and just have fun. We’ve been worrying too much out there. It’s tough trying to get wins, but we have to fight. We can’t fight with ourselves and be down on ourselves. This is the time we have to stay together the most. We need to be a team right now more than anything." Henry will have an MRI exam Monday. In his absence, recent D-League call-up Kendall Marshall stepped in as Farmar’s backup at point guard, contributing eight points and three assists. NOTES: After the Sixers missed nine of their first 10 shots in the first quarter, the Lakers promptly missed nine of their next 10. … Nick Young spent last season with Philadelphia, averaging 10.6 points while largely coming off the bench. He left as a free agent to join his favorite boyhood team in his native Los Angeles. … The Lakers are one of just four Western Conference teams with a losing record at home.